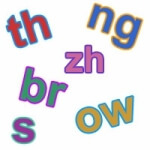 Build a Word List: You select the letters and sounds! Enter any letters, such as th and only words that start with the letters will be included. Enter up to 6 different combinations. Enter any letter or letters, such as ch or knight or even a single letter such as i.